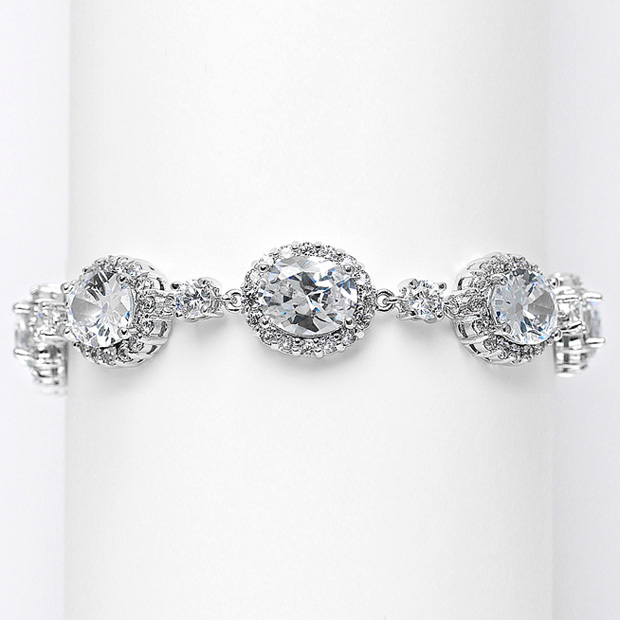 * Mariell's spectacular 7 1/4" wholesale bracelet features a magnificent row of bold Cubic Zirconia ovals each 1/2" h.
* With eight gleaming ovals separated by eight more round Cubic Zirconia, this bracelet is guaranteed to turn heads at any wedding, pageant, prom or special affair. * With a safety clasp as in fine jewelry, it looks like genuine diamonds & platinum! * For the woman with champagne taste - this is a must have. * Add this to your retail store's jewelry collection and this irresistable "eye candy" will be sold before you know it!